Here is your own private ski, hike, bike, and fish cabin. 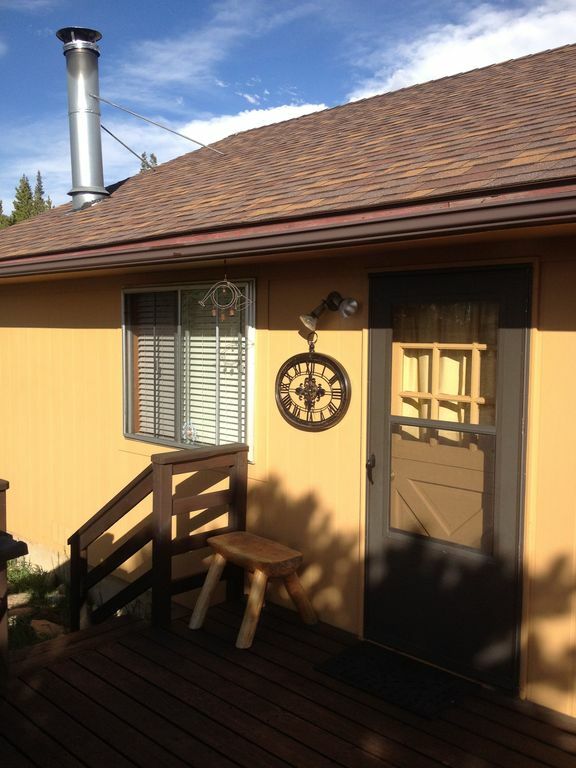 We are a privately owned cabin that sits on 1-1/2 acres very close to everything yet secluded. The hot tub sits off the deck, hidden from the road and not shared with other rentors. Summers are exceptionally beautiful here. You are right on the new Bike path that takes you to shopping or up to the reservoir. This is an awesome family getaway to try anytime of the year. This cabin is family built and owned since 1962. Dogs are my favorite people, so if they are well behaved they are always welcome. The beautiful seasons of Summit County. The variety of things to do. The ease of access from Denver. But most of all the spectacular view from my property. The privacy of this property is worth a looksee. Your own hottub and the spectacular view from the swing on the hill will stun you. Evenings on the deck are a treat you will not soon forget. Yes. Gore Range. Panoramic view. Wood burning stove in addition to forced air heating. Gas Barbecue, New Deck with a View to die for. Privacy and a non-shared hot tub. Great cabin in a great location. The property owner was very helpful when needed and the property was well maintained. We loved it here. We absolutely loved our stay. Dorothy was very helpful and easy to reach with questions. The cabin is close to everything, yet you feel like you are miles away when you are soaking in the hot tub after a day of hiking. Amazing views from the deck and hill top swing. Would definitely rent again if back in the area. Thank you! Great having you as a guest. Hope to see you return to "a little bit of heaven". Great place and host was very accommodating and helpful. The location and accomodations worked perfectly. Many amenities. Host was very accommodating and helpful; easy to communicate with from initial contact/request, onward. The cabin is unique in that it is situated on its own, yet you can walk to the nearby brewery restaurant, and other places. Would recommend, and would stay here again. Perfect Hidaway for us and our dogs. The cabin was simple, but perfect for what we were looking for. The views from the patio, and the swing were beautiful, and the hot tub was welcome after long active days. Oustanding cabin for a family of four! Outstanding! We couldn't have been more pleased with Dorothy and her cabin. Our family of 4 stayed the week before Christmas to do some skiing at the nearby resorts. The cabin had everything that we needed, from kitchen supplies, to bathroom supplies to linens. We enjoyed the location, close to town, but far enough away that is was quiet and secluded. We especially enjoyed a soak in the hot tub after a days worth of skiing. Dorothy had everything arranged, including snow removal, after we had a storm that dropped 2 feet of snow. It was nice not to have to get out and shovel. We will definitely stay again. I am blessed with exceptional guests who repeat and totally enjoy the peaceful atmosphere of the Dillon Cabin. Always welcome. WOW! This cabin was absolutely perfect for my needs. I stayed for a little over 6 weeks. Only a 10minute drive to the Keystone parking lot and not much further to Breckenridge and Copper. Enjoyed the snow shoeing opportunities at the numerous trails near by. The property sits on a huge lot with incredible mountain views. Most of my time was just my dog and myself, but I had several family and friends stay for short visits. There is plenty of room for 4. If people double up, 6 can sleep comfortably. The kitchen is laid out well and very well stocked. The owner, Dorothy, couldn't be more helpful and accommodating. She contacted me me to make sure everything was OK and to offer advice on the area. I couldn't be happier with the entire experience.